Portadown slumped to a fourth successive Bluefin Sport Championship defeat as goals from Gary Brown and Samuel McIlveen secured success for Ballyclare Comrades. 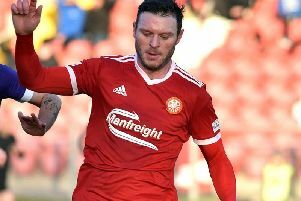 The 2-1 victory at Shamrock Park added another win to the impressive form of Clifford Adams’ energetic squad - and left title favourites Portadown searching for solutions to continued problems. The Ports suffered a setback within the opening moments when Brown’s speculative drive from distance nestled in the net via a deflection on three minutes. Niall Currie’s side produced a spirited fightback as Kevin Amuneke hit the crossbar and Gary Warwick had two close-range attempts before Comrades cleared the danger. This period of pressure was rewarded with an equaliser thanks to Stefan Lavery’s flying header off a Kyle Neill cross. However, a golden opportunity to regain the lead fell into the path of the alert Stewart Nixon when he nipped in to intercept Neill’s backpass then round goalkeeper John Connolly - only to hit the post with the final kick before the break. Comrades enjoyed the upper hand across the second half as Connolly produced saves to deny Brown and Nixon. A Fra Brennan header over the top early in the second half and injury-time effort steered wide by substitute Adam Salley proved the sum of the high-profile hosts’ efforts that, ultimately, resulted in another defeat. PORTADOWN: Connolly, Brennan, Neill, McVey, McCallum, Duffin (Ferris, 69), Kilmartin, McCullough, Warwick (Hazley, 56), Amuneke (Salley, 56), S.Lavery. Subs (not used): L.Wilson, Hazley, Upton. BALLYCLARE COMRADES: Flood, Brown, Gray, Youle, Rodgers, McCart, Dobbin, McIlveen, Robinson (Barr, 84), Nixon (Maguire, 80), Kelly (O’Hanlon, 84). Subs (not used): Johnstone, McKinty.